‘The first time a baby was born in this country, te reo Māori was the language; the first time lovers fell in love, and fell out of love, te reo Māori was the language; the first time conflict occurred and was resolved, te reo Māori was the language.’ Dr Te Ahukaramū Charles Royal shares his kōrero about the value of te reo Māori in Aotearoa. The value of the Māori language is not so that we say in Māori precisely what we would say in English anyway; but rather that the Māori language is the vehicle of or an avenue into a distinctive way of thinking about, explaining and ultimately experiencing life. For, after all, this is the value of any language – a distinctive way of experiencing, responding to and explaining life[i]. 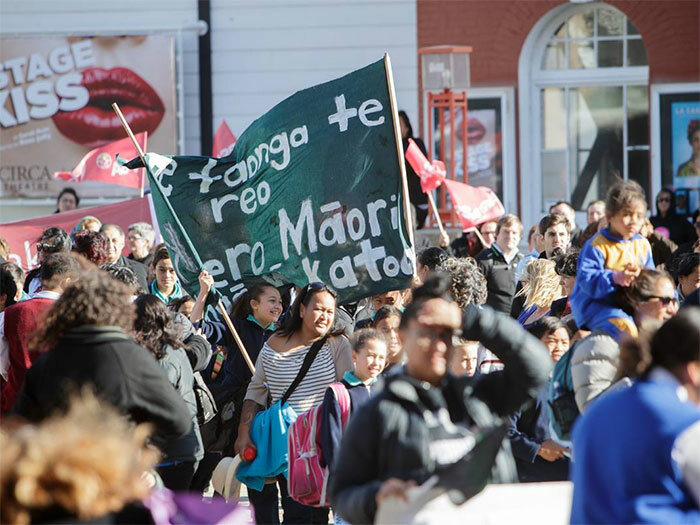 Languages share things with each other and they also differ in significant ways – and it is this ‘significant difference’ that we ultimately seek to give expression to as we foster, grow, and advance Te Reo Māori today. Of course, it is important to acknowledge that the Māori language is a taonga, a treasure of inestimable value. We should, therefore, act to ensure its future. We should also remind ourselves that New Zealand has certain obligations and responsibilities to the Māori language and we should meet them. However, we should be equally motivated and inspired (and perhaps, in time, finally so) by the tremendous enrichment and opportunity that the Māori language represents for modern day life in Aotearoa New Zealand – for this is where its value truly resides. The Māori language has been spoken in this country for hundreds of years. We do not know when exactly it was created (given its ancient Polynesian origins), but we do know that it came here in approximately 1350 (a ‘limb’ of the tree of Polynesian languages). Over the next four centuries, and prior to European arrival, what came to be known as ‘the Māori language’ changed and grew according to life in these islands. As these Polynesian pioneers encountered new species of flora and fauna, new climactic conditions (including a type of cold they would never have experienced in central Polynesia), a new landscape and waterways, so their language changed and adapted accordingly. Eventually, the entire country became ‘clothed’ in the Māori language and this remains the case today. They also had to learn new ways of harvesting resources, they had to learn how to garden and grow crops, they had to learn how to erect buildings and other structures, they had to create new kinds of clothing and so much more. While learning how to live successfully in this new environment, they also had to update ways of organising community, ways of making decisions, ways of resolving conflict and so much more. All of this took place in ‘te reo Māori’. The first time a baby was born in this country, te reo Māori was the language; the first time lovers fell in love, and fell out of love, te reo Māori was the language; the first time conflict occurred and was resolved, the first time something was lost and found again, the first time failure was endured and success was finally achieved, the first time anyone sang a song, or danced, played games and so much more, all of this was done first in the Māori language – it was the language through which humanity first came to voice in this part of the world. When Europeans arrived and brought a profoundly different worldview and experience, many aspects were enthusiastically adopted by Māori of the time. This included literacy, technologies, methods of local and national organisation and, of course, the Biblical worldview. Consequently, a tremendous amount of change and creativity took place and again the language changed and grew in response to these experiences. As we know, Māori creativity was seriously undermined in the colonial period and much was lost. However, it is vitally important to acknowledge that despite the assault upon it, the Māori language did in fact survive (perhaps miraculously so) and it remains with us today. All this history and creativity – first created, explained, and experienced in the Māori language – awaits real expression in Aotearoa today. A language is a ‘lens’ through which our entire reality is experienced and understood, a ‘way’ of encountering the world around us. The Māori language, therefore, provides us with a valuable lens, a distinctive way of ‘seeing’ our world – and the more we become familiar and fluent in the language and are exposed to the particular ways by which it describes life, the more this ‘lens’ becomes a part of us, changing us, transforming us and our world in important ways. The Māori language, therefore, represents a deep and profound opportunity to our country – a vitally important contributor to the process by which we as a nation can find own distinctive voice, our own way of thinking, articulating and being in this world. [i] C. Scott Littleton writes: ‘Thus, language, or, more properly, the logic embedded in language, is by definition a prime factor in achieving an agreement as to the nature of the world. And as languages and their attendant logics differ substantially in time and space, it is impossible to understand the nature of a given ‘agreement’ without reference to the structure of the language spoken by those who share it.’ Introduction Lucien Levy-Bruhl: How Natives Think, Princeton University Press, Princeton, New Jersey , 1985, p. xxix.